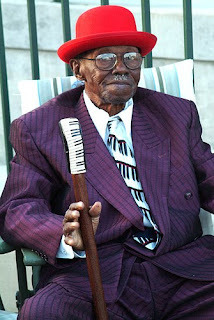 Pinetop Perkins is 97 years old today! The legendary bluesman has been performing since 1927. And he still performs, this Saturday he will be in Spain at the Hondarribia Blues Festival. After that he returns to the U.S. where he has several more concerts scheduled for this year. In 1969, after 40 years of playing, and at an age when most people retire, he replaced Otis Spann in Muddy Waters band. For the next 12 years he would help to redefine the Muddy Waters sound and bring the music to yet another generation of blues fans worldwide. Originally a guitar player in the Mississippi Delta Region, he stopped playing guitar and took up piano full time in the 1940's after an arm injury. This guy is an amazing performer who did not go solo until he was in his 80's! For the next 15 years he would release an album per year. In 1997, 2000 and 2005 he was nominated for a Grammy. Along the way he has played every venue, large and small. And Happy Birthday to you Pinetop Perkins!